A healthier Whole Grain pancake recipe. Place the flour in a large bowl, mix in the egg and gradually whisk in the milk to give a smooth batter. Heat the oil in a small frying pan and add a little of the batter to cover the base thinly. Cook for 1 minute until golden, then turn and cook for 30 seconds. Repeat to make 8 pancakes. 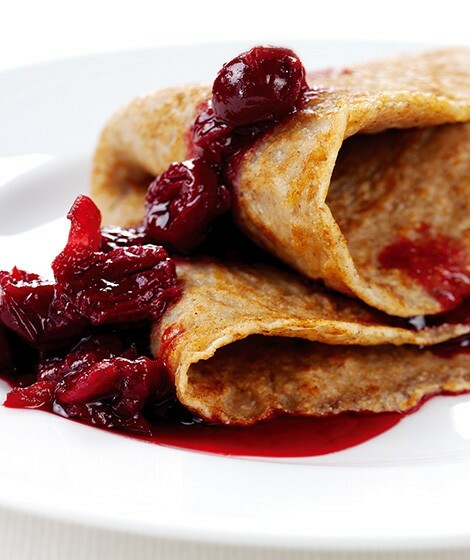 To serve, spoon some of the compote onto the pancake, roll up and serve with a spoonful of yogurt. Offer a selection of fillings for Pancake Day, such as lemon juice and sugar, or chocolate spread and banana. "its not nice im sorry but hey maybe a little less wholemeal flour would be better"
"Sorry the recipe isn't to your taste... it's one of our most popular recipes! As you quite rightly suggest though, you can cook this substituting some of the wholemeal flour with white flour - why not try half & half." "I absolutely Love Wholemeal pancakes With Berrys or ice cream"
"Me too Nick! Delicious! :)"